The answer to the other question, of how you’d get one, has up until now been “you can’t.” But that’s just changed. Christianias are now being imported and sold in the United States. Through a collaboration with Boxcycles, the same Christiania trike that we use every day for our family is now available to North Americans. Here in Portland, the trikes are available (as of today!!!) through Clevercycles. We have owned our Christiania trike since 2004. We acquired it from a cargo bike enthusiast in Oakland, California, where we lived at the time. When we got it, we were planning to have a baby, and we wanted a trike like this because it seemed like the ideal way to carry a child around. Christianias are a kind of cargo bike. Cargo bikes provide a dedicated platform or container for your cargo, usually in front of the bike operator, centered on the bike in one big unit. It’s like a giant basket. There is no need to carefully ensure that the load is balanced. You just put your stuff in the box. There are three-wheeled cargo trikes (like our Christiania, and the Nihola, and the splendid old-fashioned Nijlands heavy cargo vehicle) and two-wheeled cargo bikes (like the Van Andel Bakfiets, and similar vehicles built by Metrofiets, CETMA, Human Powered Machines, and other builders); they are generically referred to as “cargo bikes” regardless of the number of wheels. Self portrait, test-riding the Nijlands cargo trike. Alan Durning of Sightline Institute has just written a very informative post on cargo bikes, if you’d like more information, inspiration, and tons of photos. If you are looking to replace your car with an equally useful, but much cheaper and more pleasant vehicle, a real cargo bike is a great way to go. Keep in mind that you will need to dispense with some of the things you may have come to expect from your bicycling experience: speed, nimble handling, “responsiveness”, etc. This was not my experience, but I assume it is true for people who are accustomed to fast, lightweight bicycles. For my part, I have always ridden heavy, slow bikes laden with stuff, so using a 100-pound cargo bike was a relief: I could finally carry whatever I wanted on my bike without a struggle. Like a lot of cargo bikes, the Christiania is a fully-featured city bike. It has a chainguard to keep the chain from mussing your clothes; internal gears and brakes, which work well in all conditions and rarely need maintenance; metal fenders; wide, heavy duty tires; and, of course, a convenient place to carry your things. I sung its praises as a city bike in an interview last summer, with BikePortland.org. A common assumption about trikes is that they are inherently more stable than two-wheeled bikes. Cargo trikes are very stable, but in order to take advantage of their stability, you need to learn a new way to ride a pedal-powered vehicle. On a two-wheeled bike, cargo or otherwise, you turn by leaning, mostly, and by turning the handlebars very slightly. Your angle to the ground changes, and your contact to the road is strengthened by the centrifugal force that pushes the object (you and your bike) away from the center of the arc of your rotation, because that same force tightens the contact your tires have with the road. On a trike, meanwhile, your turn is wholly dependent on turning the handlebars to change direction, since you can’t lean the vehicle. The centrifugal force of the turn can cause the trike to tip to the outside of the arc of the turn, especially at higher speeds. To counteract this force, the operator must shift her weight into the turn by leaning. Once you learn to ride a trike, it’s a wonderful experience: very similar to riding a bike, of course, but with some interesting differences. The leaning into turns feels racy and fun. The feeling of “riding a bike — but differently” is similar to the pleasure of riding a fixed-wheel bike, in a way. The great advantage that a trike has over two-wheeled vehicles is its ability to stand steadily when not moving. Lock the parking brake and the trike will just sit there, no kickstand required. A trike is also easier to manage with stops and starts, for the same reason. The stability of the Christiania really shines at slow speeds, particularly when climbing hills. Because you don’t have to work to keep the bike upright at low speeds, you can just settle into pedaling slowly and work on getting up the hill. It’s easy to ride with one hand on the bars, and on the flats, I can even ride no-handed and steer with my hips. Once we were leaving a park downtown and I had a fresh cup of coffee. I was wishing I’d gotten round to installing a cup-holder (why don’t they come standard? crazy Danes!) but I found that I could easily pedal along, and even ascend the Broadway Bridge, while holding and sipping from my coffee cup. Our Christiania has been modified significantly since we bought it. The stock model came with a three-speed internal hubgear with coaster brake (plus dual disk brakes on the front). The gear range was limited, and the coaster brake made it tricky to maneuver the trike in ways that I didn’t really understand until we got rid of it. Also, the trike had the standard “shopping cart” handlebar, just one transverse bar attached to the box. These standard accouterments were fine for making short trips on relatively flat ground, but going more than about four miles one way or climbing any kind of hill (say, Alameda Ridge, where we live) made for tough going. Thus, shortly after becoming parents, we decided to invest in some improvements to the trike. We had a pair of city handlebars welded to the existing handlebar, to create a riding posture more like a standard bike. We upgraded the rear wheel to one with an eight-speed hub with a drum brake. And we had a lighting system installed. This image shows the city-bike handlebars, which were welded onto the stock crossbar by Mike Cobb, bike fabricator extraordinaire. These upgrades have greatly improved the usefulness of the trike. The wider gear range and smoother shifting make pedaling easier and more comfortable. Knowing we didn’t need to go fast on the trike, we had the lowest gear set at a mountain-scaling 19 gear inches, meaning that even with a load, I can slowly but surely climb any hill I regularly encounter (Portlanders: even 19th Avenue, going straight up the ridge. That was my benchmark). The handlebars make the handling much easier and more relaxed; I suspect this is because I can use my shoulders to guide the steering, rather than my elbows and forearms. With these modifications, the trike is more than a great cargo bike; it’s the bike I choose more often than any other, sometimes even if I don’t have cargo to haul. I just like the way it rides. A Christiania trike, modified as ours has been, can serve as an excellent family cargo vehicle. It’s true, I’m crazy about this trike, and would recommend it unreservedly to anyone seeking a well-built urban cargo bike. But there are a few things that could be improved about the Christiania, and while I’m tooting my horn out here on the web where anyone (including the designers at Christiania) can read it, I will include these things so that maybe someday they will be improved. This is a bike meant for daily urban transport, so a solid, waterproof, pre-installed generator lighting system should be a standard option. I may be speaking out of turn here — our bike is six years old and we didn’t get it directly from the manufacturer, so who knows, maybe there IS an option for a pre-installed lighting system. We had a custom front light mount installed, and have been using an LED light on a rechargeable battery; I actually installed a sidewall generator on the back, and a generator taillight as well, but I’m not so handy with the wiring, and I’m not a big fan of the sidewall generators in general, so we usually use the battery lights. We would prefer to install a dynohub wheel, but since this would go on the front, it’d ideally be both front wheels to avoid uneven wheel drag. But two new wheels, each with a dynohub (and rollerbrake! ), is a prohibitively expensive fix. This is probably splitting hairs, but the custom upgrades we made to our trike, described above, have been instrumental in making it a viable option for all of our daily use, even on hills, even over longer distances, even while zipping along in traffic. I don’t pretend that this would be an easy thing for Christiania to add on, but it sure would be worth it, certainly for the North American market. Perhaps Boxcycles, or the shops that will be carrying the trikes, will see fit to offer these upgrades to their customers. 1. What can you carry? Very close to anything you want. The trike is rated for a load of 100kg, which translates to a couple of kids and a lot of stuff, or one 220-lb adult. The box is deep and the standard canopy is waterproof, so you can load all the groceries you need, or pet food, or pet carrier, or building materials. 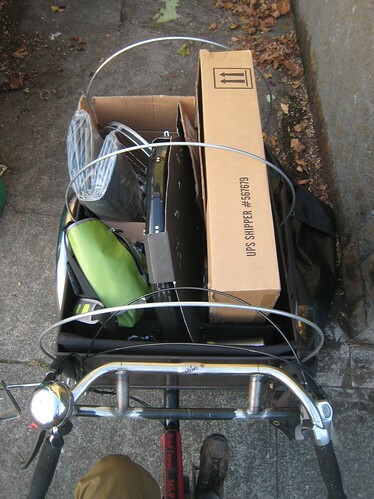 For carrying larger, bulkier items like ladders, boards, or other bikes, I’ve laid padding on the edges of the box and tied things across the top of it like a high platform. 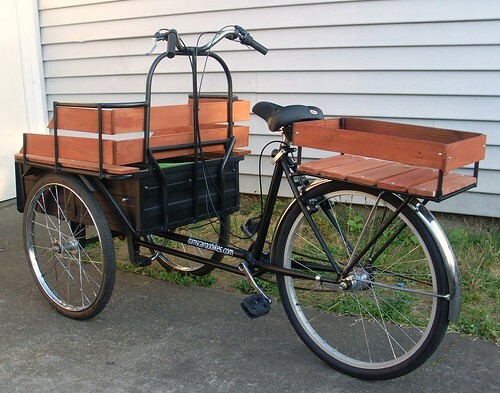 But a box bike is not ideal for this kind of cargo, so if your main cargo will be drywall or lumber or ladders, you should consider a cargo bike equipped with a platform instead of a box; or perhaps a heavy-duty trailer would serve your needs better. 2. What’s the range? It’s slow going, but I’ve taken the trike on 15-mile round trips to our CSA pickup, and the like. On a daily basis, I comfortably go five to seven miles. 3. What are terrain limitations? The Christiania is built for cities, so it’s not much good off-road. With the mods we made to the brakes and gear range, it ascends and descends hills very well, though. 4. What protection does it offer from the weather? The waterproof canopy that comes with the trike provides a dry, cozy compartment for our daughter and whatever else we need to carry. In the summer, we use a cotton sunshade that Holly designed and made. Both are easily removable while out and about, and the canopy and its support hoops store compactly in or on the cargo box, which is a great convenience (and an advantage over most other cargo bikes I’ve seen, whose covers cannot easily be removed and stored in the bike). 5. What’s it cost? Clevercycles is selling the trikes, complete with rain cover, for US$2690. Not bad for a family vehicle that requires zero fuel and nearly no maintenance. Aside from US$900 of upgrades, we’ve put about US$200 of regular maintenance into our trike, over the course of six years. Compare that to, say, one month of owning a minivan. 6. What are its storage needs? Christianias are designed to be kept outside: internal gearing, disk brakes, and a galvanized chain can withstand any weather. We used to keep ours in a garage, but we don’t have a garage any more, so we keep it locked to a bike rack in a covered alcove. The inside of the box gets a little damp from all the rain (this past spring, anyway), and needs to be kept clean, but other than that, the Christiania is happy to live outdoors. I’ve been lucky enough to try out a lot of pedal-powered cargo carriers over the past decade. We own and use our cargo trike and two trailers, one for kids, one for cargo; I’ve owned and used an Xtracycle; and we’ve owned, rented, or tested several other cargo bikes, longtail bikes and trailers. All of these devices have their place. A cargo trailer was a critical step toward our depending on bikes for our primary transport. And I loved my Xtracycle. It was fun to ride and so much more useful than a regular bike. Since we got our Christiania dialed in, though, we never use either of them anymore. Trailers and longtails introduce you to the concept of hauling your stuff by pedal power. If you are serious about depending on a bike for most of your transport, and you want to carry stuff and/or kids, you may find you need a cargo bike. If you have a car to fall back on for major grocery/garden store hauls and bad-weather kid transport, a trailer or a longtail may suit you just fine for occasional cargo hauling. But for us, for every day in every weather, a cargo bike is the solution. We rely on the waterproof cargo box to provide both a safe and comfortable seat for our daughter, and enough capacity to carry her amid the astonishing amounts of stuff we tend to either take with us or pick up along the way. The comfortable ride and sensible city-bike styling make it easy to use the bike in normal clothes in all seasons. Coincidentally, while I was writing this post, the Christiania had to go in the shop for a hub repair. We pedaled through several weeks using our old cargo trailer, a kid trailer, and a Bobike front seat. We managed our daily requirements, but it made very clear just how much more convenient, pleasant, and civilized a proper cargo bike is, compared to a passel of trailers and add-ons. Pulling around multiple trailers for a grocery store run got old fast; they’re a drag to park, and multiple starts and stops with a kid is much more complicated with a trailer than with an integrated, self-standing cargo trike. It’s also harder to just talk to my daughter when she’s behind my bike in a closed-up trailer, whereas when she’s in front of me on the trike, we can sing songs, point at passing birds, and other essential things. In addition, once the rains started up, we found out that our expensive, precisely-engineered kid trailer was nowhere near waterproof. It got downright soggy, with standing water in the footwell and the seat. No way to raise a kid. Fortunately, we got our trike back the next day. Long live the Christiania! Love the handlebars. I tried a Christiania around the block once, and didn’t like it. Your article makes me want to give it another try! Is it okay to use your handlebar photo here? We’re talking about two- and three-wheel box bikes. Most of us have only tried one or the other. Eric, it’s fine to use the photo if you credit it, thank you for asking. The handlebars make so much difference. I hope the mod becomes a trend. Wow, so cool. I’ve seen cargo bikes like this quite a bit in Germany but definitely not in the US. It’s wonderful that they’re slowly making their way over and that you’re embracing one as part of your family’s transportation system. It looks so spacious and useful, I would love to have one for carting things around. And I also want to add that I love the new masthead! Looks wonderful! S.
After I see your creative bycyle it’s look wonderful. I hope Christiania can mass production and available in my country Indonesia. Aaron, thanks, that’s wonderful. It hadn’t occurred to me to search the blogosphere and see what other Christiania owners had cooked up. I understand there are quite a few Christianiae in Australia. Great to see on your blog how you were inspired by another user and that someone else followed your lead. We are going to explore this option immediately– it’d be great to get this system in place before winter sets in. Glad I could help. I am similarly inspired by your handle bars as mine are a bit crowded with all the gadgets I have sitting on them! great to see a christiania in the US! I love any kind of ‘bakfiets’ but the christiania is my favorite. I’m from holland so I am very familiar with these bikes and I have also been to Christiania and visited the old workshop. 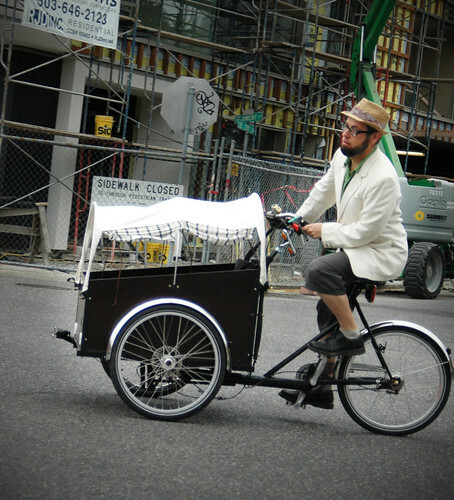 I myself never wanted to pay that much money for one so I cut an old bicycle in half and welded on some scrap metal pieces, built a box and three evenings later I had a bakfiets. It is low tech compared to the christiania but it is still running to my surprise! It’s more like the low box christiania. The front wheels are 20″ and have a frame around them unlike the newer christianias. I have used it in countless ways and at one crazy event I had 4 young women in the box!! and yes it is till running! so if my sloppy weld job can hold this I am sure a christiania can hold way more than 220Lbs. I also carried over 200kg (440lbs) of tools and materials in it ( yes all at the same time ) and was still able to get around easily although you really do not want to go up a hill with a load like that. Just thought I’d share this random info maybe just to say that it is not so crazy to think that someone made it himself. I could send some pictures if you’d like but I’m not sure where to. anyway enjoy your great christiania and everybody else…well just try one out! I love the Chistiana and cargo trikes in general but could never afford one of these so I had one built out of an old delta trike I have had for years. Tomscargo bikes here in Portland did it for me. He reversed the box from the back and put it onto the front and did some creative work with recycled wood to form the sides. I have always tried to go carless since moving to Portland and it was fairly easy with a homemade trailer, this old trike, bike buckets on my 60 year old everyday rider and our older son who could ride his own bike, but when our 2nd son was born who is now 1 1/2 I needed a new way to transport him and the groceries and for awhile the car was the way to go, but now once again we are nearly car free with the new cargo trike. Hope to see you around town with the kids in tow. sounds great Daniel! Any pictures of this amazing vehicle of yours? Here is a link to a pic of our trike. Hi Patrick – thanks for the link to my brake upgrade post. Hey just wondering have you ever had any trouble with your headset? Mine has been coming loose lately to such an extent the bolt holding the steering dampener in place was hitting the frame under the box. My LBS tightened the headset but it came loose again and he now thinks the frame tube is being worn away and retightening the headset again won’t help. Any thoughts? Thanks! Ouch. That doesn’t sound good. I have not had that experience. I would suggest talking to a framebuilder, sounds like some welding is what you need — a new headtube. But, of course, that’s my blind amateur other-side-of-the-world analysis. Hey I just found this post while trying to find good hacks for our Christiania bike. Our bike – which we bought here in Munich Germany (I’m originally from SF) – actually came with a lighting system installed. We just bought it last year so I guess the options are improving for new buyers. I was wondering if you know of any good custom child seats for the Christiania? Our daughter – thanks to her German Dad – is a big 19-months and is out of her maxi-cosi car seat. Although she can sit on the bench just fine, I worry about longer trips on the thinly cushioned seat and also about neck support when she gets tired. I haven’t found many ideas out there so far. I love the bike and use it in all but the coldest of weather – but longer trips across town tend to make her nod off and I hate to see her bouncing around so much. I remember this in-between time. We didn’t come up with much of a solution. Once or twice I brought along a few big pillows to try and cushion her ride. And while she was small enough not to be rambunctious, sometimes we would prop up the bench and make a nest from blankets and pillows on the floor of the box, and let her curl up and sleep there. It took up more room but she was very comfortable and no worries about her bouncing around in the seat. In addition, I am remembering that we had a friend install a 3-point harness onto our box, so that she’d get a little more support from the seatbelt. I saw photos of a fellow parent who used a giant stuffed puppy as a traveling companion — one big enough to lean on and fall asleep on. They called it Sleep Dog. Another ingenious solution. Love your upgrades. I’m considering purchasing a Christiania – moving to a new town and ditching the car. I’ll have a chance to test ride one briefly at a bike shop close by but then thinking of purchasing from a bike shop on the west coast and jumping in and upgrading the handlebars and brakes in a similar fashion (heading to a somewhat hilly place). Do you have any recommendations for a bike shop to handle the upgrades or did you do them yourself? 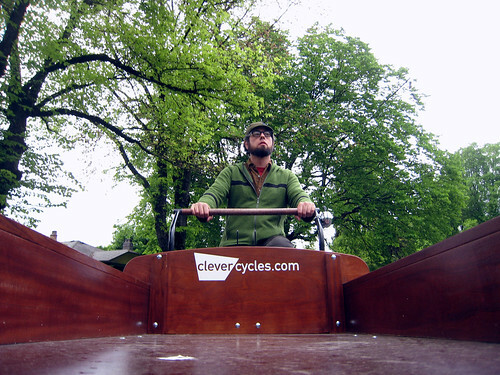 We had Clevercycles do the work here in Portland. At the time they had a framebuilder on their mechanic staff — Mike Cobb, cargo bike builder extraordinaire — and he was able to do the handlebar attachment as a separate project. Any bike shop familiar with internal gearing can do the upgrades, and any framebuilder or welder could attach the bars. It can certainly be tricky to coordinate though.